The first mobile devices to use Nvidia’s Tegra 4 chips will be announced this quarter, meaning smartphones and tablets based on the new processor should be available soon. Nvidia unwrapped Tegra 4 at the International CES trade show in January, but no device makers immediately announced products using the chip. Nvidia did say its own handheld gaming console, Project Shield, would ship with Tegra 4 in the second quarter. On Thursday, Nvidia CEO Jen-Hsun Huang said tablets are in development and that other devices with Tegra 4 will be announced this quarter. Calling it the “highest performance” mobile processor, Huang said many Android devices are being built around Tegra 4. More products will launch through the second half of the year. “Outside of phones, where we see these new computing devices becoming like entry-level PCs, performance matters,” Huang said, during Nvidia’s quarterly earnings call Thursday. Tegra 4 is based on an ARM Cortex-A15 processor design with the CPU running at a clock speed of 1.9GHz. The chip has 72 graphics cores and is capable of handling games at a maximum resolution of 3200 by 2000 pixels. Tegra 4 succeeds Tegra 3, which was based on a Cortex-A9 design. 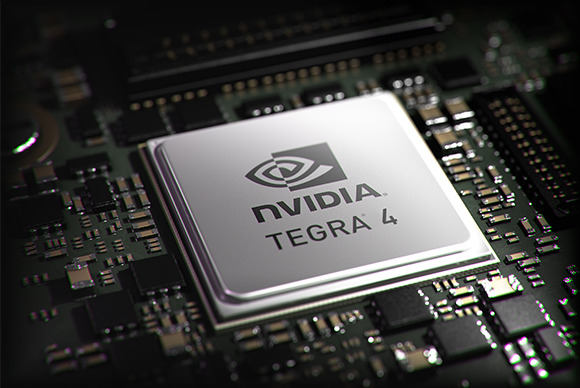 Nvidia has also introduced the Tegra 4i, which has a modified Cortex-A9 design and an integrated, software-defined LTE radio. Carriers are certifying the Tegra 4i for use in devices that could be available in the second half of the year, Huang said. Also Thursday, Nvidia reported revenue of $954.7 million for the quarter ended April 28, up 3.2 percent from the same quarter a year earlier. Net profit was $77.9 million, up 29 percent from a year earlier. The revenue growth came from higher sales of graphics cards, while Tegra sales were down 22.2 percent as smartphone and tablet makers wound down their production of Tegra 3 devices, CFO Karen Burns said. With a powerful graphics engine and the latest ARM processor design, Tegra 4 will likely go into high-performance smartphones and tablets, said Jack Gold, principal analyst at J. Gold Associates. But there are many questions about the chip’s power consumption, Gold added. Nvidia had to get Tegra 4 out quickly because of the “hyper-competitive” market for ARM-based chips, Gold said. Nvidia’s primary competitor is Qualcomm, which announced new ARM-based Snapdragon chips at CES. Qualcomm’s chips shipped first and are already offered in some new smartphones, such as Samsung’s Galaxy S4 and the HTC One.